Experience, experience, experience – that was the theme at this year’s Enterprise Connect. Whether discussing the contact center, collaboration, or plain old unified communications, it was all about experience – including Customer Experience (CX), User Experience (UX), Employee Experience (EX), and Agent Experience (AX). Businesses are realizing that the technology is just one part of an overall business communication solution, and that the impact on users is what really counts. As I noted in my End User Adoption session, you could have the best technology in the world, but it doesn't matter if end users are not using it. When it comes to customer service, the best AI and routing technologies aren’t important if the customer isn’t getting the information they need. Similarly, agent experience is key – if contact center agents are not engaged or motivated, it will impact the quality of service they provide to customers, ultimately impacting the customer experience. Employee experience has been a passion of mine for a while, and I was thrilled to hear Microsoft’s Lori Wright, General Manager, Microsoft 365, begin her keynote session discussing the role of employee engagement and how “You can drive higher employee engagement with the right tools.” Wright also highlighted the user experience as she demonstrated new features that make Microsoft Teams more inclusive and effective, such as Live captions and subtitles that make Teams meetings more inclusive for attendees who are deaf or hard of hearing, have different levels of language proficiency, or are connecting from a loud location. In addition to Experience, there were several other key themes at Enterprise Connect. AI is here. While real-life examples are still few and far between, the use cases for AI in the enterprise for collaboration and communications is real. Cisco’s Collaboration Technology Group SVP, Amy Chang, as enthusiastic as ever, demonstrated what Cisco calls “People Insights” and showed how Cisco’s Cognitive Collaboration weaves intelligence and context into every aspect of collaboration, dramatically improving the meeting and overall collaboration experience. Google of course highlighted new AI capabilities such as Gmail Smart Reply. Without going through each and every session and presenter, suffice it to say that AI was hot, and next year will be even hotter with more use cases and proof points. AI is of course incredibly hot in the contact center. Every vendor I met with discussed using AI and natural language processing, speech and sentiment analytics, with discussions around how AI is going beyond the use of bots to capabilities like Agent Assist, next-best action, predictive routing, WEM, forecasting, and more. Cloudy with a bit of hybrid. It goes without saying that cloud was a hot topic, as vendors discussed the various flavors of cloud – pure cloud (aka UCaaS, CCaaS, and even BCaaS), private cloud, and hybrid cloud. There are pros and cons to each and there’s no one right answer or winner. The cloud is clearly the way forward for businesses of all types and sizes, although there were some discussions about the value and benefits of premises-based solutions in some situations. I was actually taken aback when a vendor told me about his company’s latest announcement about a premises-based solution. On the contact center front, the key themes were customer experience (of course), AI (also of course), the movement to the cloud at the pace that makes sense for the business, and the merging together of CRM and contact center technologies. CPaaS, APIs, and the role of the developer. As more and more organizations choose to use tools from Twilio, Nexmo, Ribbon’s Kandy, VoxImplant, and others, the role of the developer takes center stage. Businesses have more options than ever before to customize their business communications solutions and develop the solutions that best meet their needs. My schedule was filled with one vendor meeting after another. To recap the key messages from these meetings, I decided to let you hear from the vendors in their own words. My apologies to the companies I didn’t have a chance to meet with or do a video interview. At last year’s Enterprise Connect, CoreDial discussed its acquisition of contact center provider Voice4Net. In August, the company released CoreNexa Contact Center, aimed at SMBs and sold as a private label service through its channel partners. This year the company announced a new CCaaS certification program to help its channel partners succeed in selling CoreDial’s CoreNexa CCaaS offerings. As CEO Alan Rihm noted during an analyst breakfast, “What we did for UC, we’re now doing for contact center.” Rihm said that CoreDial’s “secret sauce” is enabling end-to-end automation and self provisioning (SDMI) to empower the channel, while providing new high margin revenue streams and opportunity. Building on its Bria Teams communication and collaboration solution offering voice, video, team messaging, and screen sharing aimed at SMBs, Counterpath introduced Bria Teams Pro, offering dedicated virtual meeting rooms with HD audio and video conferencing. With the new collaboration capabilities, each user has a dedicated meeting room, and participants can join via the Bria Teams application or web browser. Supporting up to 200 internal or external participants, the HD video supports 1080p for desktop and 720p for mobile. In addition, chat rooms with persistent chat are now available for all Bria Teams users, including both Standard and Pro. There’s a new kid in town – Edify Labs (not to be confused with the previous Edify CRM). The company launched the Edify global business communications platform at Enterprise Connect, combining UCaaS, CCaaS, and CPaaS to provide a Business Communications as a Service (BCaaS) cloud-based tool, providing a single tool with a single dashboard from a single vendor. (Note: We at BCStrategies love the term BCaaS). According to Cameron Weeks, Edify co-founder, “There’s so much technology overlap between business collaboration, UC, and contact center – why can’t they be in one place?” Edify set out to create what it considers the first truly completely integrated business communications platform, integrating contact center, UC, and collaboration in one platform from Day 1, and all built on top of Edify’s CPaaS platform. The Edify platform combines contact center, UC, team collaboration, and PBX functionality with AI and machine learning capabilities, featuring Edify’s intelligent conversation routing engine named Hammond. As an omnichannel contact center service, Edify provides AID – Automated Interaction Distribution, as well as coaching and training. On the UC side, the platform provides voice/telephony built on Edify’s One Cloud voice network that is globally available with 12 Global Data Regions. It also offers collaboration capabilities including screen share, conference bridge, video chat, voice mail transcription, and more. Edify offers a simple pricing structure, with the first five users free forever, and 100% SLA with 10x contract financial guarantee. At a lunch for analysts and consultants, Genesys’ CMO Merijn te Booij, and Janelle Dieken, Senior Vice President, Solutions and Product Marketing, discussed the company’s massive growth in 2018, highlighting 130% growth in PureCloud sales since 2017, and the success of the PureBridge program in transitioning 1,200 companies from legacy solutions to Genesys in the past two years. 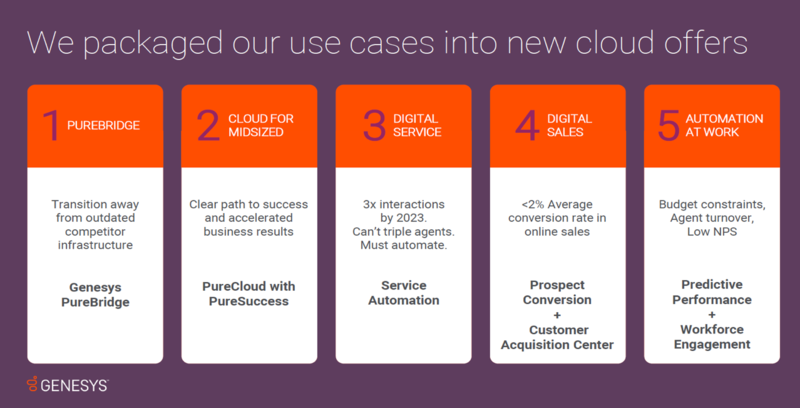 Te Booij and Dieken provided an update on Genesys’ platforms – PureCloud, PureConnect, and PureEngage – and discussed the company’s vision of how AI, digital, and cloud are converging and need to work together in single platform. They also discussed how they took 60 use cases and packaged them into several offers or collection of use cases sold for a single price, available for cloud, on-prem, and hybrid customers. We also heard more about how Kate, Genesys’ AI foundation and the personification of Genesys AI for Blended AI, is providing proven business results for voicebots, predictive routing, chatbots, interaction analytics, AI-based WFM, Performance DNA, and with the AltoCloud customer journey platform. Genesys also provided a sneak peak into the upcoming Summer Release, but that will have to wait for another time. Glance is a visual engagement company providing tools that overlay customer engagement. The company’s vision is to “humanize online communication by integrating easy-to-use omni-channel visual engagement solutions into the customer experience for instant, relevant, and effortless conversations.” The technology lets agents or experts in an organization connect to customers “in the moment, on any device without having to click, to reduce or eliminate customer effort while providing ubiquity to connect from any device. Companies can build solutions to provide expertise-on-demand. For example, Intuit TurboTax can create CPAs on demand. Using one-way video and co-browsing capabilities, Intuit’s tax experts can view the customer’s screen with the tax forms and highlight areas to help the customer fill out their forms, while the one-way video lets the customer see the TurboTax expert with whom they're speaking. Glance’s solution lets users see, show, and share with a single click. Google is saving its big announcements for its upcoming Google Cloud Next ’19 conference. This year expect some exciting news on Google Voice for G Suite users. 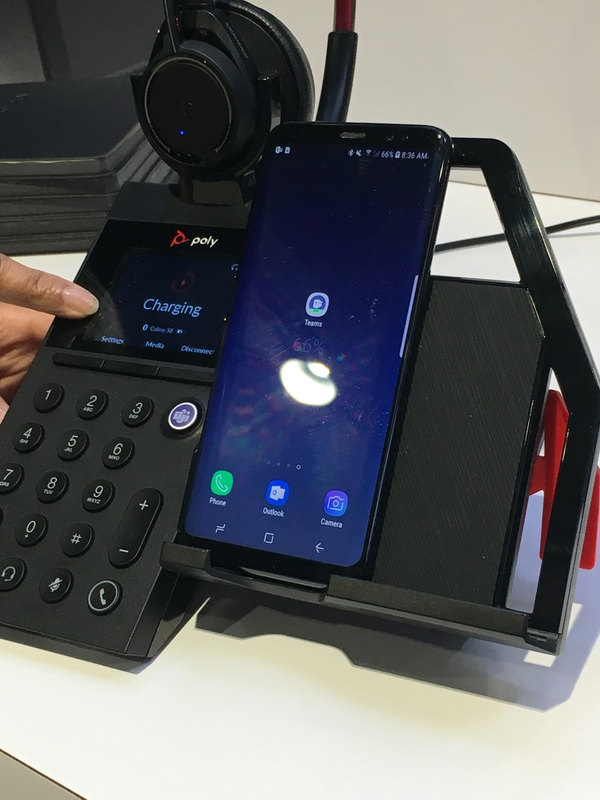 According to Smita Hashim, PM Director, Google Voice, Google has been doing telephony for 10 years and has carrier relationships in over a hundred countries that power products like Ads, Android and Google Fi. It made sense to create an enterprise version of its popular consumer-based Google Voice service (based on Google’s acquisition of Grand Central – hat tip to founder Craig Walker). Google Voice for G Suite is currently available through a Beta program with over 600 customers live. Aimed at Google G Suite users, the service will not be sold standalone (there is no indication whether this will change in the future). Providing a cloud native user experience, it will offer PSTN connectivity, integrations with Google Hangouts Meet, Hangouts Chat, Google Calendar, and Google Contacts, and provides users with a phone number that isn’t tied to a device, allowing users to make and receive calls from any device. New administration capabilities within G Suite administration console can be used to set up new numbers, assign phones, and more. No surprise, the service will also feature Google AI capabilities to deliver features such as speech to text, text to speech, voicemail transcription, spam filtering, and more. While more details will be provided at Google Cloud Next ’19, Google will introduce three tiers of bundled offerings for the U.S., Canada, other markets. Expect to see a good portion of Google G Suite customers replace or augment their existing phone systems with Google Voice in the coming years. Hivefive’s solution was based on WebRTC capabilities to make the room experience easier, and uses the Dolby codec to provide high-quality audio. On the backend, Highfive uses Twilio for local numbers. Manuele noted that Highfive developed the first WebRTC camera and in partnership with Dolby added voice capabilities. Running on the AWS infrastructure, the service doesn't require client downloads and integrates with other cloud services, such as Slack, Outlook, and Google Calendar. One of the company’s differentiators is its ability to move calls and meetings from mobile devices to in-room devices and meeting rooms without disconnecting or interrupting the interaction. Currently aimed at SMBs and SME, Highfive is also preparing to move to the enterprise market. The solution is subscription-based, with no hardware to purchase, as hardware is provided as part of the monthly subscription fee, also known as HWaaS. There are three packages based on the cameras used. There’s lots of competition in the video market, and Highfive is trying to disrupt the market with its focus on ease of use and its software and hardware as-a-service model. Masergy, a B2B managed service provider of SD-WAN, UCaaS, CCaaS and Security, made a couple of exciting announcements at Enterprise Connect. They launched a new AI-powered Intelligent Virtual Agent to complement the company’s UCaaS and CCaaS offerings. Masergy developed the solution with their technology partner, Inference Solutions. The intuitive virtual agent uses Natural Language Processing coupled with predictive analytics to provide virtual assistant and chatbot features for Masergy Global UCaaS solutions. It also serves as the queuing agent for Masergy Cloud Contact Center. The new intelligent and conversational virtual agent with AI capabilities can detect and analyze what customers are saying in real time, making it easier for businesses to provide immediate responses to customers, while providing a better experience than standard IVR systems. According to Dean Manzoori, vice president of Global Cloud Communications, the Intelligent Virtual Agent is directly integrated into Masergy’s software-defined global platform to provide end-to-end guarantee of service. Masergy also announced that they are a Global Premier Partner for Cisco’s Customer Journey Platform (CJP). They have seen lots of customer demand and success migrating global enterprises from premises-based systems to an omnichannel cloud contact center. Mitel’s key messages at Enterprise Connect were around its various cloud options. During a discussion with CMO Wes Durow, he explained that “The world is going cloud and not necessarily UCaaS,” adding, “Customers all say they want to go cloud, but ‘going cloud’ means different things.” For example, for Mitel customer the San Francisco Giants, going cloud means private cloud. Mitel has various options for the cloud, and reiterated its key message that there’s no one right cloud for everyone, and that Mitel provides public (UCaaS), private, and hybrid cloud services, as well as contact center applications that combine mobility, SaaS integration, and IoT and AI technologies. Durow also noted that the company is seeing a lot of growth in private cloud, as customers want to control the upgrade cycle, integrations, etc. He described how Mitel is driving innovation and focusing on the next generation of collaboration by partnering with global cloud companies. For example, leveraging partnerships with Amazon and Google and using MiCollab and facial recognition technology, Mitel can identify high-value customers (or bad guys) in a sports stadium as they walk through the gate. Lastly, Durow mentioned a significant OEM deal that isn’t public yet, so stay tuned. NEC discussed one of my favorite topics – employee experience (EX). Noting that digital transformation requires businesses to prioritize customer experience (CX), which requires a commitment to employee experience, NEC discussed how its Smart Workspace delivers great employee experiences. By providing work flexibility, better collaboration, improved productivity and engagement, companies deploying Smart Workspace are more able to reduce workplace costs, retain top talent, and create a great work culture. The NEC Smart Workplace, based on the NEC UNIVERGE Integration Platform, connects employee experiences by providing team collaboration, contact center, meeting, conferencing, video, mobile device support, biometric security, and more. These solutions are offered on-prem, in NEC’s public or private cloud, or in a hybrid deployment model. NEC “Extreme Experiences” solutions focus on safety, security, and operational efficiency, leveraging NEC’s UC, biometric, and Smart Workspaces technologies to empower employees. For example, NEC described how its platform empowers new experiences, such as the “Visitor Experience” for Front Desk Access leveraging NEC’s facial recognition, or Desk Reservation for open offices enabling mobile apps to book desks in advance while leveraging face recognition. As I stated earlier, it’s all about experiences. Nextiva continues its momentum, opening new offices and adding staff, including a new CTO and CRO, while continuing to add high profile, enterprise clients. For the past couple years, the company has been focused on the convergence of UCaaS, CRM, and analytics/AI/automation, leading to the 2018 introduction of NextOS, an all-in-one business communication software platform. The NextOS platform features voice, team collaboration, customer engagement, as well as Service/Sales CRM, automation, chat, surveys, and more. New features being added to NextOS include extended business rules, advanced permissions, and of course, AI. Customer Relationship Suite – providing case management, lead management, live chat, surveys, multi-modal communication, analytics, and AI. Campaign management, SMS, team collaboration, and a mobile app will be coming soon. Collaboration Suite – featuring persistent conversations, audio/video calls, calendar/document/screen sharing, online meetings, and a mobile app. Communication Suite – includes VoIP (including mobile app and video/meetings) PLUS all the features of the Customer Relationship Suite. According to CMO Yaniv Masjedi, the new suite makes it simple for businesses of any size to make an impact on their customer base, providing components to help customers grow their business at a price point that works. Contact Center Core: providing global carrier-grade voice, self-service IVR, integrated softphone, smart routing for Salesforce digital channels, and advanced call and screen recording. To discuss these new announcements, I spoke with Laura Marx, VP Global Alliance & Partner Marketing. No video, but a great dinner at Moors, where Serenova kicked off Enterprise Connect by hosting its annual analyst dinner. The company focused on the momentum it is experiencing with its recent launch of native quality management, CxEngage Quality Management, and discussed how its unification of CCaaS with Quality Management was designed to overcome the limitations of siloed solutions through a consolidated, 360-view of customer and agent interactions. Serenova noted that organizations can now fully support the entire quality assessment and skills management lifecycle to ensure delivery of a superior customer experience. As a result, Serenova experienced an attach rate of 90% of its customer deals in Q4 2018 alone. With an integrated QM and CCaaS solution, Serenova’s customers can take a proactive approach to uncovering opportunities for coaching and training to ensure their agents are always delivering a top-notch customer experience. Talkdesk had big news at Enterprise Connect with the announcement of a new workforce management offering that is part of the Talkdesk WEM suite. The company notes that its workforce engagement (WEM) mission is to inspire contact centers to reimagine the agent experience. Talkdesk Workforce Management, powered by Talkdesk iQ, is a mobile-ready, cloud-native service built on a microservices architecture and is fully integrated with Talkedesk’s CCaaS platform to provide a seamless experience for customers. The workforce management solution was completely built internally, which is an impressive undertaking, especially for a company as young as Talkdesk. With this offering, Talkdesk is moving closer toward offering a full suite solution, which is important as the company moves upmarket. The Talkdesk WEM suite includes workforce management (WFM) today, with performance and quality management being added in the near future. Leveraging AI technology based on Talkdesk iQ, it offers AI assist for quality management, workforce management, and coaching. The goal is to have an AI assistant for every stage in the WEM world. Talkdesk will continue to support partner WFM solutions such as Teleopti, providing customers with choices. Although Twilio didn’t make any big announcements at Enterprise Connect, its presence was felt throughout the event, from vendors demonstrating capabilities that rely on Twilio APIs on the backend, to several sessions discussing the role of CPaaS and developers and Twilio Flex. Several vendors announced new products or relationships with Twilio. For example, Zoom announced that Twilio is now a part of the Zoom Contact Center Partner Program. And Twilio Flex partner, Perficient, created a live Contact Center Experience that was demoed in a booth Perficient shared with Twilio. To participate in the experience customers at Enterprise Connect used SMS, WhatsApp, or Voice to connect with a provided phone number and received tailored responses. Using large screens to show off these personalized responses as well as the customized agent experience was a great way of demonstrating how an IVR collects customer details and how the agent experience is customized when the Flex Agent engages the customer. And it showed off how an interaction can be managed through multiple channels. CX Cloud Express: Based on Vonage’s acquisition of NewVoiceMedia, CX Cloud Express is a CRM-integrated contact center solution designed as an expansion of the Vonage Business Cloud (VBC). The first integrated offering of Vonage Business Cloud and the NewVoiceMedia contact center solution, it is designed specifically for mid-market businesses. CX Cloud Express provides customers with a single, integrated offering - from carrier to application - simplifying their communications needs with a single partner for service and support delivered on a carrier strength network. CX Cloud Express is currently optimized for voice, with omnichannel capabilities being added in the near future. Number programmability on the VBC platform: Enterprises can now take any VBC number and extend it using Nexmo’s APIs, enabling enterprises to customize their communications system to meet their own unique business needs with just a few lines of code. Any VBC number can be intelligently programmed to route calls, enable chatbots, create custom communications applications and voice and messaging workflows, and integrate with third-party systems. Number programmability can be used for a wide variety of capabilities, such as masking a caller’s phone number to provide anonymity; automatically scheduling a call-back time when the call recipient is busy or on another call; and integrating with any translation API will use AI to recognize the language and give you the English translation, word for word. Vonage notes that companies going through digital transformation are rethinking the role of communication, and number programmability provides more flexibility to create applications and call flows, bringing voice, text, and SMS together on a single platform. Last year, AVST merged with XMedius. At Enterprise Connect, XMedius provided an update on the company, including the rebranding of all of its products under the XM brand. The company announced that it has made its XM TeamQ informal call center application for teams and workgroups available as a standalone application or as an add-on to the company’s XM Connect (formerly CX-E) UC platform. XM TeamQ is aimed at knowledge workers in informal call centers or teams that handle a good number of calls but are not “formal” call centers requiring costly contact center technologies, such as human resources or IT help desks. It provides traditional call center capabilities such as routing, queuing, screen pop, call recording, reporting and analytics, estimated wait time, call back, skills-based routing, as well as a supervisor interface to monitor agents and teams, and can work with any cloud or premises-based PBX. Calls can be delivered to any device including desk phones, mobile devices and softphones. The standalone solution supports up to 250 agents and 50 teams, and provides an option for customers that need this functionality without having the XM Connect platform. Build on a strong foundation of global talent, global brand trust, and core NTT organizational values. The new NTT global operating company will have 43,000 employees worldwide, with a presence in 88 countries and regions. It will be the 11th largest ICT provider in the world by revenue. They also discussed the company’s Digital Workplace offerings, aimed at helping companies create business value by enabling and empowering their workforce. Dimension Data takes a holistic view that considers culture, technology, and the physical environment, and focused on employee engagement (yes, I was very happy to hear this brought up). The new operating company has a lot of work ahead to bring together all of the various pieces, and hopefully it will meet its aggressive goals. Microsoft: Microsoft made too many Teams announcements to cover here. During a briefing when asked about future contact center offerings, Microsoft noted that it will have some contact center capabilities built into Teams, but will continue to rely on partners for full-featured contact center capabilities. I expect to hear some interesting news about APIs related to contact center partners from the Microsoft’s Build conference for developers in May. Microsoft also had a booth tour for the analysts, showing off Surface Hub 2, the many devices designed to work with Microsoft Teams, and more. There’s quite a range of devices from partners including Poly, Crestron, Yealink, and Audiocodes. I had other meetings, dinners, lunches, and of course conversations over wine, and I apologize to anyone not covered here. As you can see, Enterprise Connect was a whirlwind! I didn’t have much time to wander the show floor except between meetings, but from what I saw, it was pretty darn impressive – with many new vendors and lots of creativity. 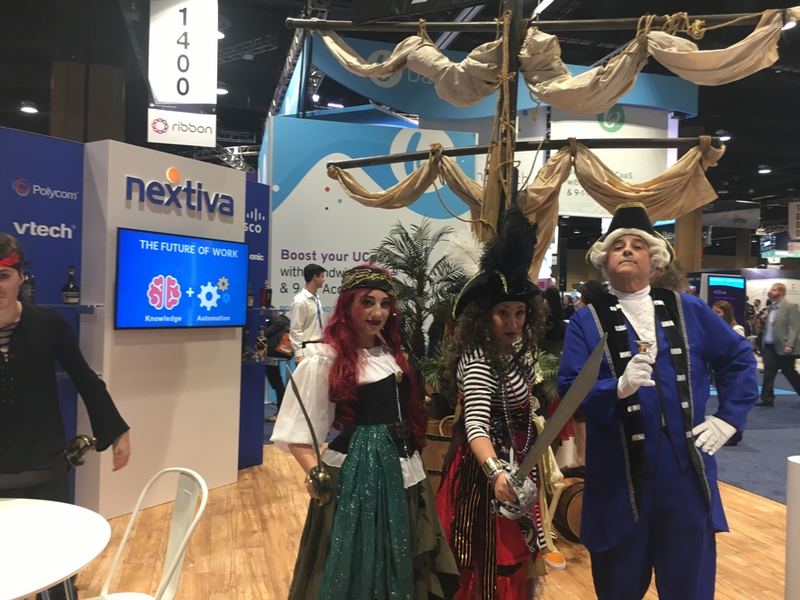 My award for the most creative and fun booth (not the tallest or fanciest) goes to Nextiva, which featured a cast of pirates entertaining attendees. Using the treasure map with the location of the booth and a key in their conference bags, participants tried to unlock the treasure chest at the booth for a chance to win prizes. The bottles of rum were a big hit! 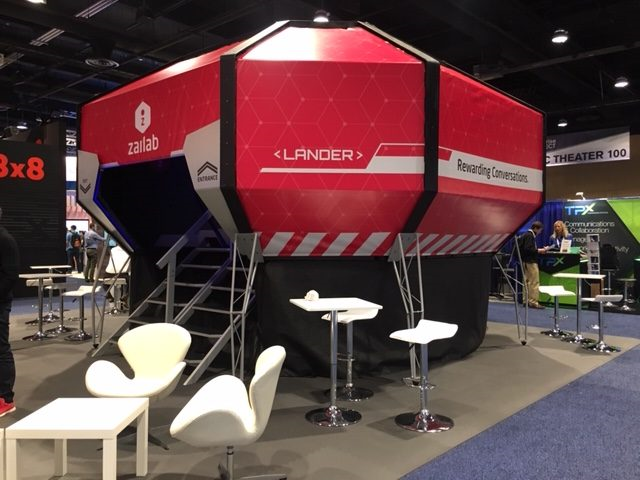 Zailab had another note-worthy booth that garnered a lot of attention for the South African-based contact center provider. This time it was a lunar lander. There were lots more announcements, and I barely touched on the keynotes and the many, many sessions (including the sessions I moderated or participated in). All in all, Enterprise Connect 19 portends for a great future for business communications vendors, customers, and partners (and of course, analysts and consultants!). See you next time under the Gaylord Palms biodome!